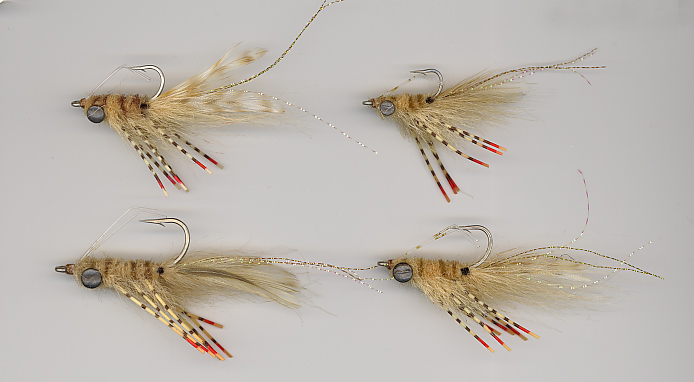 The Ragin' Craven is a fabulous pattern for bonefish and permit. This is a very useful pattern for areas where larger flies are important, like the Florida Keys. The Ragin' Craven serves well as both a shrimp and a crab imitation - the fish sees what it wants to see! This fly is also an excellent choice for redfish and other gamefish which feed in a flats environment. Monofilament weedguard. Note: This fly is weighted with lead eyes - the larger sizes are heavier than the average bonefish fly. Good for windy days, deep water, or muddy water. The Ragin' Craven is tied on Tiemco 811S hooks. Fly design by Charlie Craven - tied by Umpqua Feather Merchants. Want to tie the Ragin' Craven? See this link on Charlie Craven's website (outside link - please use your browser's "Back" button to return to Saltwaterflies.com).